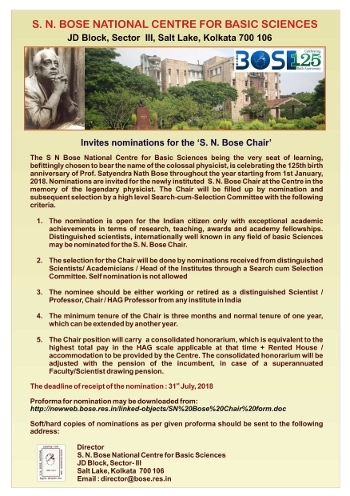 NATIONAL SUMMER SCHOOL ON STATISTICAL PHYSICS : On the occasion of Celebration of 125th Birth Anniversary of Professor Satyendra Nath Bose. Organized at the Centre during 4 - 15 June, 2018. The Computer Services Cell of the Center, Kolkata has organized a 1‐day workshop on “WORKSHOP ON MATHEMATICA - Research, Development, Deployment & Progress” on June 11, 2018. The said workshop was inaugurated by Director Prof. Samit K Ray, SNBNCBS.Around 53 participants including faculty and research scholars actively participated in the workshop.The entire session was very interactive. The S. N. Bose Centre has observed the "International Yoga Day" on Thursday, 21st June, 2018 through an interactive Yoga session and active participation by staff and students.